— Puzzle No 2 — “L.A. 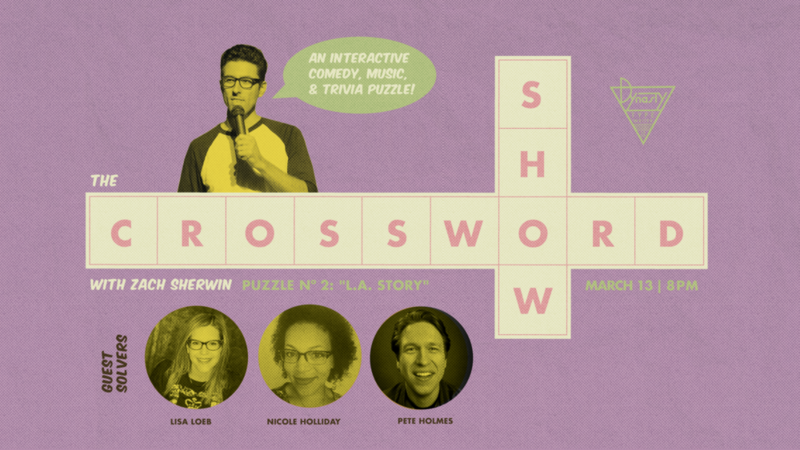 Story"
A smart, one-of-a-kind show in which a panel of guests solves a crossword live onstage in front of an audience, with the puzzle projected on a screen so the crowd can follow the action. There's music. There's comedy. There's trivia. There's nothing like it! Hosted by Zach Sherwin (Epic Rap Battles of History, Crazy Ex-Girlfriend). *Day of show tickets based on availability. If an event is sold out online, there will be no tickets available at the door unless otherwise posted on our socials.